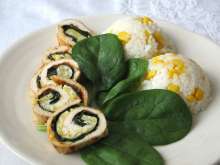 Easy and fast prep of light dietetic lunch or dinner. 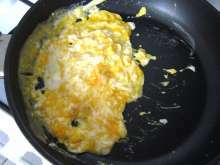 Melt a bit of butter in a saucepan, add egg with salt and stir the scrambled eggs. 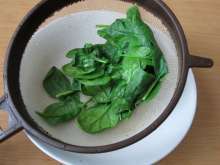 Wash the spinach through the sieve, pour hot water over and let it drain away. 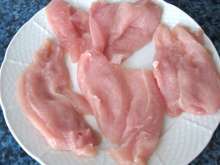 Dry washed chicken breasts and cut into 4 schnitzels. Pound it from both sides, spread on the board, salt, sprinkle with paprika and garlic. 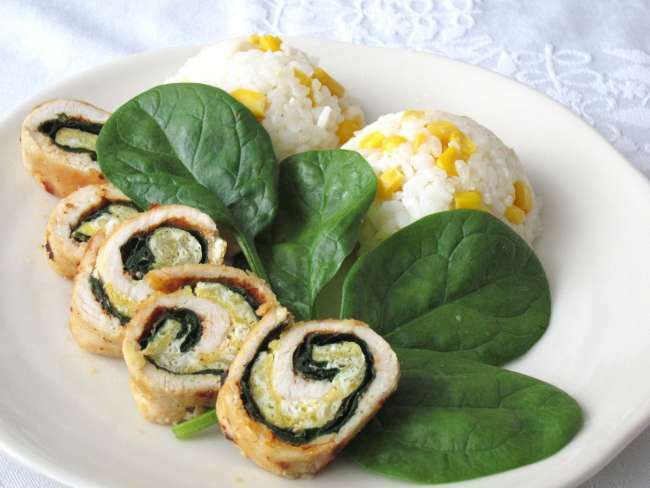 Spread spinach leaves over the meat. 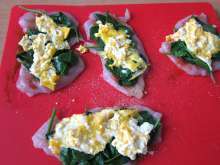 Spread the scrambled eggs on the spinach. Heat the oil in the skillet. 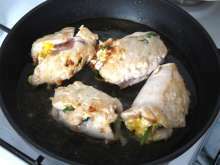 Roll the chicken breasts into the roulades and sear it in oil, from both sides so they shrink. Pour in a water, cover and steam for 20 minutes. Then uncover, turn the roulades and let the water steam out for 5 minutes. 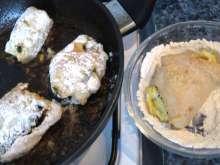 Finally dip them slightly into the flour, put back into the skillet, drip with oil and saute from all sides. 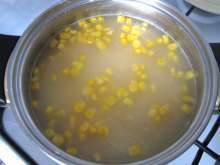 Wash the rise through the sieve , let it drain out, fry in oil and stir in the corn. 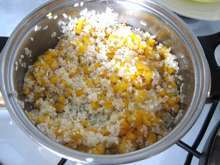 Salt, pour in a hot water till about 1 cm above the rise surface and cook until soft. Blend it. 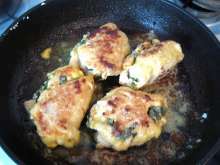 Give corn rise with the roulades and serve with fresh spinach leaves.